So you're planning a trip to Los Angeles and wondering where the best places to stay are on a budget? ​Well I am not going to lie, L.A. is one of the most expensive cities for accommodation in the USA and trying to find somewhere nice to stay on a budget in the city of angels can especially be a challenge. However, it is not only possible to find rooms for under $50 a night in Los Angeles, but you can also find these budget friendly accommodations in some really cool locations. Hotel rooms in L.A. on average cost around $200 a night. This seems pointless to me to spend that amount on a room in a city where there is so much to explore AND where little time should be spent inside! Instead of staying in some overpriced room, why not stay at a hostel and spend the money saved on fun activities, eating and shopping? Dorm rooms at these hostels will only set you back about $30 a night which is a huge saving when you compare what it would cost to stay at a hotel in the same area. ​But wait, I hear you say you don't want to share a room with strangers? Well then why not book a private room in a hostel? A private room in a hostel will still be half the price of staying in a hotel in these cool neighborhood's. And, if you are travelling with a friend you can splits the costs. ​There are many other added bonuses to staying at a hostel that will save you money such as having a kitchen you can cook in, free social events and the added bonus of meeting other travelers. Below is a list of the 4 coolest hostels to stay at in L.A. They have been chosen because they are clean, have a fun atmosphere and are conveniently located in the hippest area's of Los Angeles you will want to explore! The Venice Beach Hostel has an amazing beach side location only a stone's throw from the ocean front boardwalk. It is also within walking distance of hipster Abbott Kinney Boulevard. Venice is known for its quirky characters, creative local artists, boho-chic fashion stores and fuchsia colored beach sunsets. From this hostel you will be able to walk out the front door and rent a bicycle and explore the Venice Beach area including the canals or ride to Santa Monica and check out the Santa Monica Pier. You can also rent surfboards from stores nearby and catch a few waves (if you don't know how to surf you can get a lesson for very reasonable prices) otherwise just relax on the beach. Oh and there is an awesome rooftop bar across the road! This is my favorite place to stay on a budget in L.A. because of it's central location at Melrose and Fairfax. You can easily visit Hollywood Boulevard from here and see the Walk of Fame. Sunset Strip is walking distance, and so is the Grove and the Farmers Market. Not too far is Beverly Hills, Rodeo Drive, LACMA and the La Brea Tar Pits. You can even stumble over to Pink's Hot Dogs in the wee hours if you feel inclined. We stayed the first time with my mother (and she wasn't the only older person staying) in a private room which was a bargain at $90! Yes, this is a bargain in LA... good location and not run down and dirty like some cheap motels in the area. The second time, Jamie and I stayed for about two weeks while we were searching to buy a van. They have a huge kitchen, free breakfast, free tea and coffee all day and some fun social nights. It's got a very chill vibe and the travelers we met were super friendly. Banana Bungalows at the Hollywood location seemed to have a more livelier crowd than the West Hollywood location. This hostel is in the midst of the Hollywood action and in fact you can even see the Hollywood Sign from the courtyard. They offer many amenities; free coffee and tea all day, free breakfast, private bath in every room and dorm, free BBQ's, karaoke nights and much more. You can take a virtual tour of the Banana Bungalow hostel in Hollywood here. ​Dorm beds start from $25 a night and you can get a private room for about $80 depending on the season. This hostel is a great find for Los Angeles because staying in Santa Monica is super expensive! The HI Santa Monica Hostel has an amazing location only one block away from gorgeous Santa Monica Beach and a short stroll to Third Street promenade so this is the perfect place to live out your California dream! They do offer free breakfast, they have a free pool table and have some free tours and activities. The only downside to this hostel is that it is a touch more expensive than the others for dorm rooms with bed starting at $37 and going upwards to $67(like I said, Santa Monica is expensive)! Ready to plan your L.A. trip? If you are reading this post, I imagine you are trying to plan your Los Angeles trip on a budget. The following links mentioned below will help you keep your travel costs to a minimum. If you are only planning a short trip to Los Angeles and it is your first time visiting, read our guide L.A. in 2 Days. This itinerary will show you how to see the city's top attractions in 48 hours. 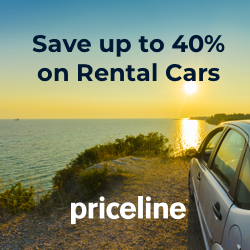 If you are planning on renting a car to explore the city, check out priceline to find our which car rental agency has the cheapest rates on the dates you will be traveling. If you don't feel like you could handle driving in L.A.'s hectic traffic, you can organize a sightseeing tour of Los Angeles. There are many to choose from that cover destinations that include Downtown, Venice Beach, Santa Monica and more. Most tours are inexpensive and cover a lot! If you are planning on visiting more than one theme park in Los Angeles, you will save money on admission prices if you purchase a Los Angeles Go Card. You can view what theme parks and attractions there are for you to choose from on the their website.